Former Prime Minister and Defense Minister blasts Netanyahu's conduct with regards to military aid package from the United States. 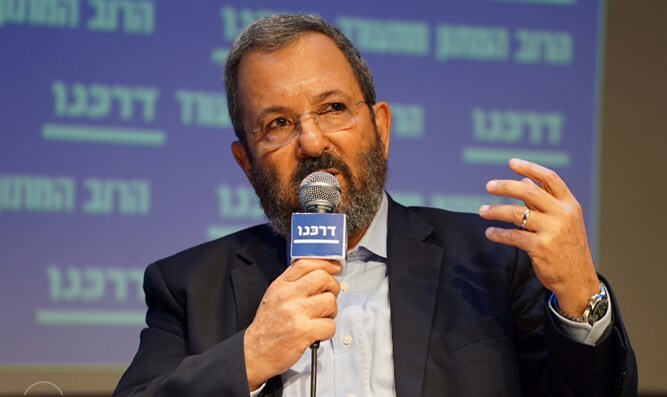 Former Prime Minister and Defense Minister Ehud Barak on Wednesday launched a scathing attack on Prime Minister Binyamin Netanyahu, blasting him for his conduct with regards to the military aid package from the United States. Barak, who spoke at a conference of the Darkenu organization (the new name for the organization previously known as V15 which worked against Netanyahu and the Likud in the last election), accused Netanyahu of acting like a “gambler” with regards to the military aid from the U.S.
"When the agreement for the next decade is finalized, the damage that Netanyahu's promiscuous gambling caused to his relationship with the White House will be revealed," Barak charged. "Instead of receiving 4.5 billion dollars a year, as was expected a year ago, Israel will receive just 3.8 and only subject to an undertaking not to demand more from Congress," he continued. He went on to claim that the memorandum of understanding in question is bad for Israel, and claimed that signing it would be a serious mistake. Barak accused Netanyahu of causing serious harm to Israel's security by holding the talks publicly instead of behind the scenes. "Such lawlessness," said Barak, who claimed that Netanyahu knew in advance of some harsh statements made by Minister Avigdor Liberman's about President Barack Obama and accused the Prime Minister of not knowing how to deal with the Americans. “At a time when Prime Minister Netanyahu is going to bring an unprecedented assistance agreement with the United States of nearly 40 billion dollars, we are still waiting for the billion dollars of military aid from the U.S. that Barak promised we would receive during his hasty retreat from Lebanon - a withdrawal that led to the takeover of Iran and Hezbollah of southern Lebanon and to the firing of thousands of missiles on Israeli cities,” the party said. Barak’s comments come as Israel and the U.S. continue talks on a new aid package to replace the existing one which remains in force until 2018. Despite disagreements about the scope of the package, officials in Washington recently said they believe Netanyahu would sign the new memorandum of understanding with the Obama administration instead of waiting for the next president. A senior American official said two weeks ago the sides have bridged some of the remaining gaps and could reach a deal soon.